The residential complex designed by architects Elke Ladurner and Stephan Marx in Silandro, South Tyrol is located in the old castle grounds, which stretch from Schlandersburg Castle to the Schlandereck residence. The residential complex designed by architects Elke Ladurner and Stephan Marx in Silandro, South Tyrol is located in the old castle grounds, which stretch from Schlandersburg Castle to the Schlandereck residence. A contemporary connection between historical fabric and mountain landscape. Building in a context of outstanding natural and historical importance is a real challenge. The design team formed of Elke Ladurner and Stephan Marx are no newcomers to this kind of task, mainly working in the South Tyrol area where a combination like this requiring respect for the urban setting and natural backdrop is the order of the day. This situation has arisen once more in Silandro, where the architecture team were asked to design the two volumes forming the new residential complex called Schlossgarten - the castle garden - built on the exact same grounds as the old Baroque-style castle gardens, which stretch from Schlandersburg Castle to the Schlandereck residence. The site itself is surrounded by a boundary wall protected by the Sovrintendenza ai Beni Culturali (the Italian cultural heritage preservation oversight body). The same site used to be home to the Schlossgarten guesthouse built in 1977, replaced by the new project, which retained the name. The complex is formed of two buildings with a total of 22 housing units and the architects from the Stephan Marx studio wanted to create a system to assure as much light and space as possible for every single apartment. They rotated the two polygons differently, which allowed them to maintain the view of the tower of the castle in Silandro and to keep the two multi-storey buildings distant from each other. This way, they managed to preserve as much space as possible for the garden, although it is smaller than before. The two buildings - the smaller two-storey building at the front with 9 apartments and the rear three-storey building with 13 apartments - have a smooth facade made from light-coloured concrete, which communicates with the glazed part of the balconies and the dark window frames. The apartments have been set back from the facade to leave room for the patios and balconies that offer great views over the town and surrounding nature in the privacy of your own home. The large, full-height windows ensure that all the main living areas are bright and flooded with light. The attention to the environment is not limited to the landscape as the residential complex is certified as Clima House (Klimahaus) in category A. 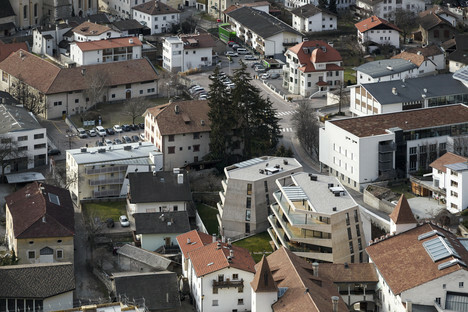 The slightly deconstructive appearance of the two volumes in the Schlossgarten residential complex makes them, somewhat reminiscent of the faceted rock of the nearby mountains, just what the client wanted and also in line with the desire of the architects to craft an ongoing connection with both the majestic mountain landscape and with the town of Silandro. The success of this endeavour is perfectly summed up in the shots by Samuel Holzner, architecture photographer from South Tyrol. Our readers are lucky because he is sharing them for the first time with us.